Fireside Bibles offers music CDs, session plans for youth activites, women’s study program, workbooks, and Scripture-based question and answer materials. Shop our quality selection for the classroom materials that are perfect for your group. Fireside Catholic Publishing exclusive Librosario® line of Catholic Bibles is the most popular Catholic Gift Bible Edition published today. 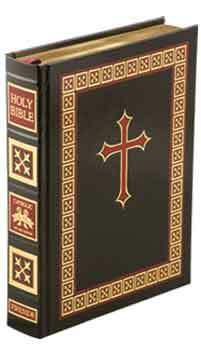 Its unique cover material and design incorporates rosary, crucifix, and a unique soft textual quality that makes a Librosario® Bible a joy to use. Fireside Catholic Publishing provides a variety of Catholic teaching tools for the classroom teacher, catechist, parishioner, Deacon and Priest. Catholic Teaching resources for RCIA, Women’s Bible Study, Youth Groups, Parish School of Religion, Sacramental Preparation, Home Schooling and more.